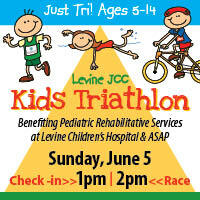 The Levine JCC Kids Triathlon will directly support the rehabilitation programs at Levine Children’s Hospital. These programs are available to infants and children of all walks of life. After a child suffers a significant injury or illness, they often need inpatient rehabilitation services to regain the strength and functional skills necessary to return home or to school. Levine Children’s Hospital provides the region’s only comprehensive inpatient rehabilitation services for children and adolescents who have experienced a debilitating illness or injury. With a continuity of care that is unparalleled, LCH offers high level of care outpatient programs. After release from the hospital, LCH patients have the opportunity to participate in the Adaptive Sports and Adventures Program, which is a part of Carolinas Rehabilitation. This program, open to anyone in the community, is designed to challenge youth (and adults) with physical disabilities to develop skills that will lead to and enhance an active and productive lifestyle — one without barriers.